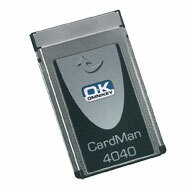 The OMNIKEY® 4040 reader is designed to secure laptops or other mobile devices using smart card technology that can be connected via PCMCIA. Small and handy, these mobile smart card readers offer the same first- class technology as our desktop versions. Compliant with all major industry standards, the 4040 reader is compatible with virtually any contact smart card, operating system and application, making it the preferred solutions for integration into notebooks, PDAs or other PC bus-based systems.